REUTERS/Thomas PeterGerman Chancellor Angela Merkel speaks during a news conference after the Saxony local election in September. Germany’s growth forecast just got slashed by the International Monetary Fund (IMF): It knocked 0.5 points of its growth forecast for this year, a worse slowdown than the eurozone overall. A German recession, or at least the shrinking of the country’s manufacturing base, suddenly seems possible. The country already recorded a drop in GDP in the second quarter of the year. Germany Can’t Escape The Eurozone. Germany has been the eurozone’s notable outperformer in the last few years, weathering the financial crisis and euro crisis to an impressive degree. But that doesn’t mean it can buck regional trends completely: Eurozone growth is somewhere between low and non-existent, and the currency union’s other large economies are Germany’s main export partners. Poor domestic demand there will mean a limited market for Germany’s firms. 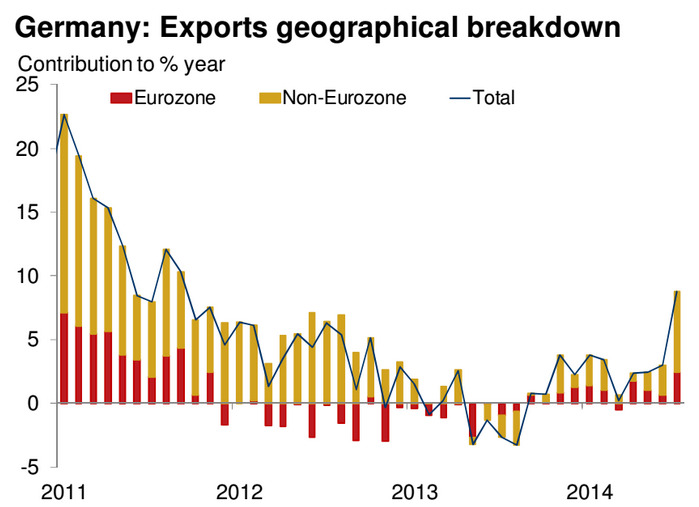 The chart below from Oxford Economics shows how little Europe’s “recovery” since the recession that ended in 2013 has boosted German exports. Asia’s current slowdown isn’t coming to an end any time soon. The IMF expects Chinese growth to fall below 7% during the next couple of years, the lowest level since the early 1990s. An Energy Policy U-Turn Leaves The Country At Risk. German coal use is back at the highest levels in nearly a quarter of a decade, after the country’s U-turn on nuclear power. 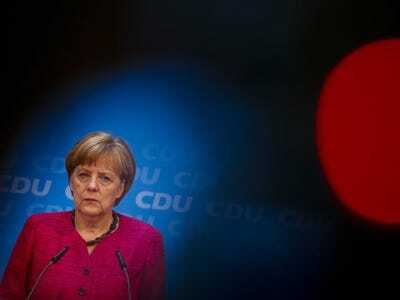 The Financial Times is calling it “arguably the most ill-judged decision of (Angela Merkel’s) eight years in office.” The policy change was made after Japan’s Fukushima disaster, though Germany is not exactly exposed to tsunamis in the same way. Germany is already a very expensive country for energy use, even by European standards, and the decision makes it more reliant on Russia. “Energy intensive industries in particular have lost confidence in the future of Germany as a business location, ” former Deutsche Bank chief economist Thomas Mayer told Reuters.